In this booklet Virtually all Western massage is massage primarily of the muscles. Whatever its virtues, Western massage is all together different from Chi Massage. 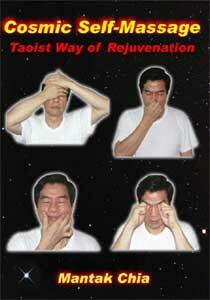 Tao Rejuvenation employs one's own internal energy, Chi energy, to strengthen and rejuvenate the sense organs eyes, ears, nose, tongue, teeth and skin and the inner organs. The techniques used by Taoists are some five thousand years old and until very recently were closely guarded secrets passed on from a Master to a small group at students. Often, too, each Master knew only a small part. Now Master Chia has pieced together the active system of Chi Massage in a logical sequence in such a way that once you have it shown to you you need only five or ten minutes of practice daily. In short order you will note improvement in complexion, taste, vision, hearing, sinuses, gums, teeth, fanged, the internal organs and general stamina.